A review of the 1960 thriller directed by Alfred Hitchcock and starring Anthony Perkins. Synopsis: Desperate to help her lover get out of debt because he told her that is the only reason he hasn’t married her, a young woman steals $40,000 in cash from her boss and flees across country be with her boyfriend. After a heavy rain causes her to get off of the main highway, she stops at a secluded motel run by a mother-obsessed Norman Bates. This, as she discovers too late, proves to be a fatal error. The movie stars Janet Leigh, Anthony Perkins, Vera Miles, John Gavin and Martin Balsam. I’ve watched other Alfred Hitchcock films with my oldest daughter but, up until this weekend, had not let her watch one of his most famous films, Psycho. However, we had an opportunity to do just that on Friday night and, after making sure it wouldn’t disturb her too much, we ended up choosing it as our Friday night movie. It had been a while since I had seen this film and, because of that, I didn’t remember a whole lot about it. However, as it turned out, the movie was as good as I remembered it being. To be honest, the film didn’t have quite the same magic because I already knew the secret about his mother and there weren’t as many surprises as a result. That being said, even with knowing that secret, I still thought this movie was pretty decent. The characters were very believable. Leigh’s Marion Crane character was a relatively good person who made a mistake and her guilt was very prominent. And, Perkins really pulled off Bates’ character really well. He had a way of making you very uncomfortable even when he was being friendly. The one thing I wish the movie would have done was spend a bit more time explaining the relationship between Crane and her boyfriend Sam Loomis (Gavin). Either Gavin’s performance was very stiff or his character didn’t really care about Marion and was just using her. The movie never really clarifies that. This was disappointing because, if he was using her and really had no intention of marrying her, it would have added a whole new element to the movie. Hitchcock made quite a few great movies but there is a reason why this film is one of his most famous. Great acting (other than maybe Gavin) and a well-executed story make this movie worth watching even if you have seen it before. In this companion book to "Love Poems for My Wife," Steven Helmer uses poetry to express his feelings about being a husband, a parent and about life in general. 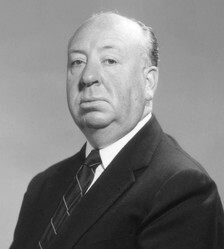 I have seen Alfred Hitchcock's short stories in TV serial, they are full of suspense and excitement. The flow of the events keep your curiosity and eagerness to know what will happen next. A review of the 1941 movie starring Spencer Tracy and Ingrid Bergman. Three horror films that could benefit from either a better script or better special effects.